The Kemp’s Ridley (Lepidochelys kempii) sea turtle (also know as the Atlantic Ridley) is a small olive green to black looking sea turtles that reaches a maximum size of 58–70 cm (23–28 in) carapace length and weighing only 36–45 kg (79–99 lb). One of the organization I do occasional volunteer work for and with which I have a lot of personal familiarity is Gulf Specimen Marine Laboratory. This lab is one of the premier suppliers of ocean specimens to scientists around the world. They also do sea turtle rescue. And the sea turtle they most often rescue is juvenile Kemp’s Ridleys. GSML is located in a region famed for blue crabs and juvenile Ridleys eat a lot of crabs. So GSML is Florida’s juvenile Ridley headquarters. This entry was posted in Uncategorized on January 18, 2016 by tumbleweedstumbling. I had been having some issues with an intermittent leak somewhere behind my toilet. It wasn’t much so I just put a rag down and watched and changed the rag once in a while. While traveling through North Carolina we went into a campground where the water was high pressure, even with our pressure reducer. We had a really bad leak then, I mean water pooling on the floor. We went back to using our pump instead of the direct hook up and the problem seemed to go away. However at this point the leak was too much to just ignore. I got that creepy “we are in for something” feeling so I started researching on line. I came across this video which explained the problem and how to fix it. From the video I was able to figure out the problem and the spare part I needed which I ordered on line. Normally I find Amazon a bit pricey and use one of the other RV parts services but this time Amazon was the best price. Fine. Everything arrived safe and well and since the thing wasn’t leaking at that particular moment, I just kind of put it aside to deal with other more fun stuff, like walking on the beach and watching dolphins. This morning, while doing laundry we had a small catastrophe. We ended up with water running under the bathroom wall into the bedroom and accumulating under the box we keep the dog food in. I hadn’t noticed this slow leakage before so when we pulled out the dog food box to mop up….ugh…mold. So we were in for a major cleanup with bleach and that meant hauling everything out, wiping the offending areas throughly, letting it all stand to dry. Naturally, once you start cleaning one area another demands your attention. 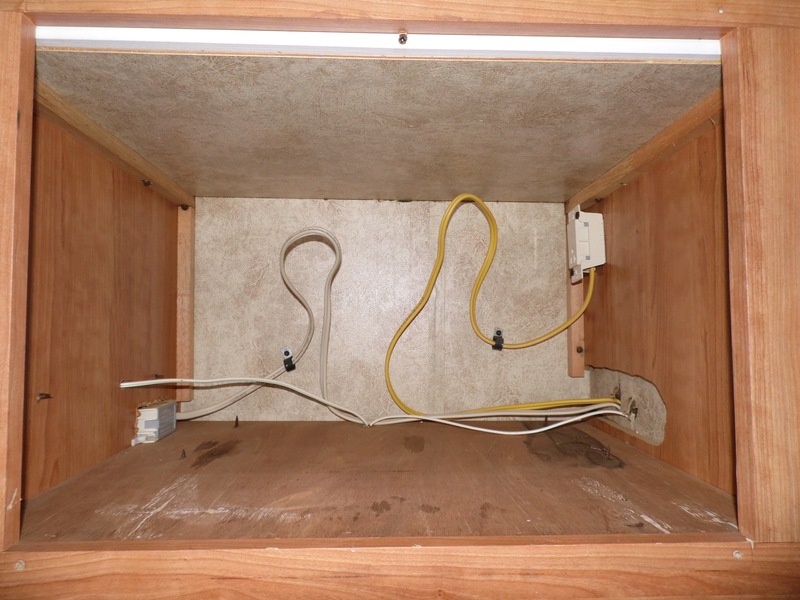 We also decided to do the closet with the musty odour and found condensation had created more trouble, so more cleaning, more bleach and chaos and disorder spilling from the bedroom out onto the rest of the trailer. It was definitely time to fix that leak! The instructions looked so easy. It is ever that easy? Well, in a word, no. The bolts holding the toilet down had rusted to the point that when we tried to unscrew them, all we succeeded in doing was stripping them underneath in the floor. There was no way those bolts were coming off without cutting them or breaking the toilet. That used three cusses. After considered our options, including trying to use a mirror to see in order to replace things (which did not work) we decided the sanest thing to do was to make a new access door. That was a two person, six more cuss, job but we did it. One thing very important was to have one person making sure the saw did not do through the plumbing on the toilet side. The other thing was to get the spotter person to hold the wood panelling steady so it doesn’t bounce back and forth while the saw is doing the job. Once we had our access hatch, the rest was easy. Hubby dearest couldn’t really get a good picture as I changed the module due to the small working space, but that video I linked above shows it very well. I could reach through, unscrew the screw and safety tab, and pull the old water module out, and replace it with the new “Thetford Water Module Replacement” The module is attached to the main plumbing with a really simply screw off/screw on end. There is an even simple small hose attachment to the water outlet on the toilet. The unit slips back in place to be held in by a tab and a single screw and then the lever stuck in. Oops, one more cuss and back up. It has to go screw on water supply, attach toilet water outlet, THEN put the hook in and after the hook is in place, do the tab and screwing in the screw is the very last thing. We tested it and we found the toilet was all fixed and working like new. Note to RV manufacturers: Thetford makes a really great product with easy to change module. Why can’t you find a way to install the toilet without leaving only one inch clearance in back? I mean you could put it six inches out from the wall and put a shelf over it or something. I am also left with an uneasy feeling. What will I do if I ever have to replace the entire toilet? That toilet is not coming off without a major bathroom renovation. We will have to pay someone else to do it because that fix is simply beyond us. For now, I will just hope the toilet outlasts the trailer. And we now have two holes in the wall to somehow fix. I think a hatch door is in order. That way, we can easily get in there again if we need to. I think we will donate that spare ring we didn’t use to one of the small RV repair businesses we encounter on our travels. They are always happy to take any new spare parts they know they will use and doing that invites good karma. One fellow gave us some free spare fuses for such a part. And so job three is done. When we first arrived in Florida, the thermostat on the fridge quit and I had to change that. Then the microwave died, and today it was the toilet module. They say things come in threes. Hopefully we’re done for a while. Today, I’m off to the hardware store to find the parts we need to make the new door for our new access hatch. Unlike the additional microwave trim, which can wait until the day before we have to move, the new access must be fixed ASAP. Not only does it allow easy access to the back of the toilet, it also allows any smell immediately back into the bedroom. And it is not an acceptable way to awoken when you are the person lying in the bed and the one using the toilet is the cat. Our six year old Panasonic microwave oven quit on us a couple of weeks ago. It blew the fuse, made the breaker pop and then released great quantities of stinky burning rubber and funny noises just before popping the main breaker. Obviously not a good thing. So we removed it. I was actually surprised to discover the old microwave was just set in an opening in the wall with a plug and a frame around the outside. While we decided what to do, the space served as an impromptu shelf. My research taught me a couple of things. First, there is a special class for microwaves that go into RVs. They are made to take all the extra bumping up and down the highway. You can’t just put in any old microwave. Second, the original one we had was no longer being manufactured.After some shopping around on line I found a replacement that was almost perfect size from one of my favourite RV parts stores, AdventureRV.net. While their selection is somewhat limited, over the years we have found that if they do have what you want, it arrives quickly and reliably and is cheaper than anywhere else. And they had the microwave we wanted. The new microwave arrived 7 days after we ordered it for a total with shipping of $220USD. We had to put the frame on but it was really easy. One screwdriver and a few screws and we were set. We also had to screw on the top vent so hot steamy air goes out of the front of the space instead of into it. The hardest part was lifting it up into the space after plugging it in. We plugged it in and set it in place on top of the new steel protective panel they provided and voila. New microwave set up and ready. Now we did end up with a space on the top because it isn’t a precise fit. Before we put the final four screws that secures the frame to the wall in we will have to go the lumber place and get twenty inches of 7/8 square wood and some trim. So we will wait until we have that to finish the job. Otherwise, it is a go! We have a functioning microwave again. No one paid me for my review! This entry was posted in Tumbleweeds Tumbling and tagged Frugal Living, microwave ovens, RVing on January 5, 2016 by tumbleweedstumbling.